Although this shelf has few materials, it is a bit tricky to build and you may need a second set of hands for parts of the project. It is surprisingly sturdy. 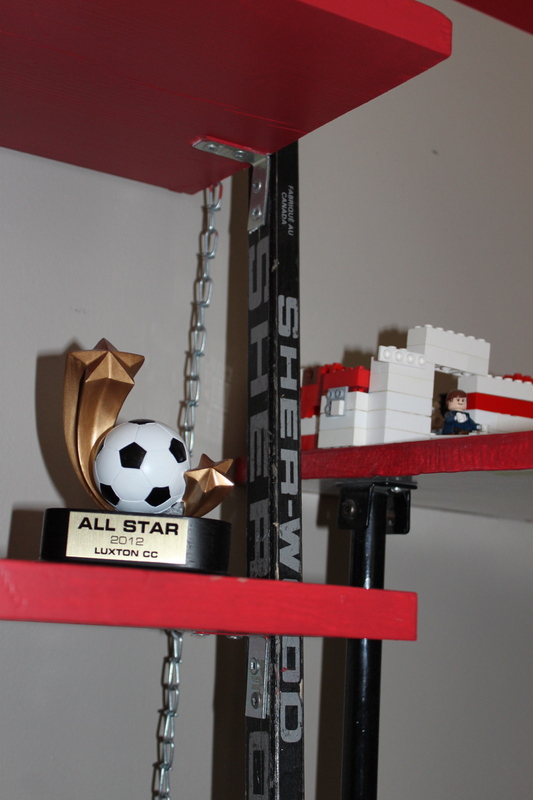 We have never put too much weight on it, but it has held Shay’s trophies and stacks of books with no problem. The stability comes from the wall, the floor and gravity. Here is a quick tutorial. Cut and paint three boards to your specifications. The trickiest part is aligning the sticks and then mounting your boards. To do this, you need to lean your hockey sticks against the wall at a natural angle. Take one shelf at a time and hold it against the side of the hockey stick and back as far as it will go so that it is touching the wall for added support. Hold up the L bracket and mark where the holes on the shelf will need to be as well as where the L bracket will be mounted on the stick. You want to make sure that your shelf will sit level, but your stick will sit at an angle, so it is a bit tricky. You must do each shelf individually, because the shelf closest to the top will have the L bracket closer to the back of the board, while the shelf closer to the floor will have the bracket closer to the front of the board because of the lean of the stick. You can probably do the measuring and figuring on one end/side and then use it as a guide to mount the bracket on the other end of the shelf and the second hockey stick. Mount the L brackets on the under sides of the shelves according to where you marked them. 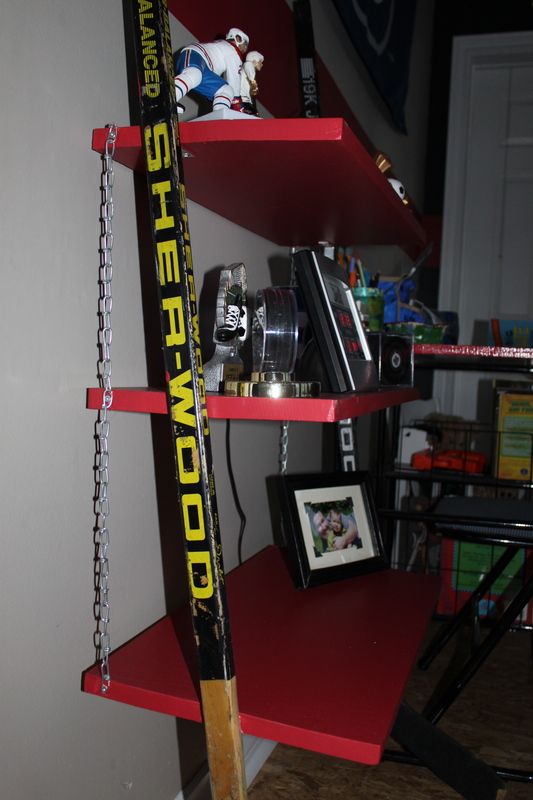 Mount the brackets (and shelf) to the hockey sticks. Use a screw to secure the chain along the side of the shelves near the back of the board. The chain will help to make sure that the shelves will sit and remain level, so be sure to have your shelf against the wall and make adjustments before securing the chain to all three boards. This shows the L bracket on the underside of the shelf. You will notice it is sitting towards the back of the shelf as this is a photo of the top shelf. This side view shows the chain and the angle of the stick. You can see how the placement of the L bracket sits further forward on the lower shelves. This project was not expensive, but a little bit finicky. It was worth the effort and the finished shelf looks good and works well. Shay loved it! 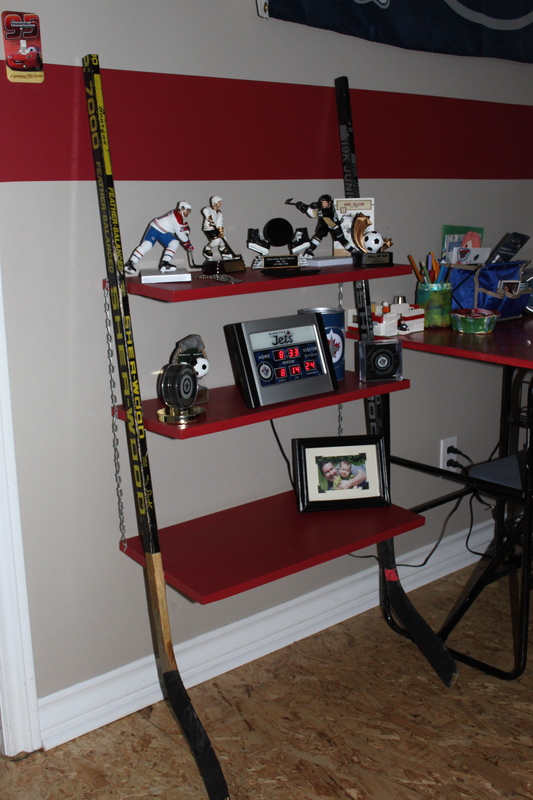 Posted on August 22, 2013 by Cindy Roy •	This entry was posted in DIY and Upcycling and tagged boys bedroom ideas, decorating a boy's bedroom, hockey bedroom decor, hockey decor, hockey stick shelf, hockey theme, hockey themed bedroom. Bookmark the permalink. Great project Cindy. You do have some good ideas !! !